Jesus freak Hideout (John DiBiase): So it's a pretty big deal being inducted into the Walk of Fame, isn't it? Michael W. Smith: It's a little surreal. I don't feel like I deserved that. JFH (John): You totally deserved it. I was looking at pictures afterward. I took some as they were unveiling it. I was looking at it and I was like "What is going through your mind when you've worked so hard over so many years." To get something like that… it's just so permanent. I get the chills just thinking about it. I think you deserve it; that's just my honest opinion. Michael: Well, I appreciate it. JFH (John): So how do you know Jim Caviezel? Michael: I met Jim seven or eight years ago at the Dove Awards. It was a funny introduction. He wanted to meet me. I just knew he was in the movie The Count of Monte Cristo, which is really one of my favorite movies he's ever done. He started quoting some things and I was just like… "Nice to meet you too." He was a huge Smitty fan. I didn't talk to him for a couple of years and then Mel [Gibson] came to town and I went and saw a special viewing of The Passion of the Christ before it came out and I had a hunch that I was supposed to call Jim. I got his number and called him and he called me back. He said "I can't believe you called me." We've been best friends ever since. He was out on the road with me this weekend. He came out and hung out. Right after one of my shows, we flew home and he spent the day with me. I told him that it would be a real blessing to those people if he came out and gave a little passion talk… and he did. I guess Chaz, my manager called and I wasn't supposed to know anything about him coming. It was supposed to be a surprise. He really came to present me my Walk of Fame award. JFH (John): Are you working on any new projects coming up? Michael: A new Christmas album. JFH (John): What kind of sound are you going for? Michael: Cinematic, huge. I've already been in the studios in London with the London Philharmonic Orchestra. I'm pretty pumped. I've been there before and done it and it's just so unbelievable when you have a seventy-piece orchestra. It's very much like the first Christmas album I did where a lot of the stuff is original but it's not so classically based. You feel like you're in a movie a little bit. It's just very cinematic. You listen to it and you feel like it could be in a movie but it feels like Christmas. The melodies are very holiday-ish. I think of the movie Home Alone and some of those other Christmas things. *laughs* I'm writing these songs that are very into the Christmas thing and I can't believe that I'm doing it. JFH (John): Is it a mix of traditional and originals again? JFH (John): I really liked the instrumentals that you did for The Second Chance. JFH (Amy): We saw The Second Chance in New York City because it wasn't being shown where we're from around Bethlehem. I really liked it a lot. I didn't have any expectations going into it… I didn't know what it was going to be about so I had a really open perspective and I thought it was really good. Michael: It's a good story. JFH (Amy): We drive around places in Nashville and we say sometimes "I wonder if this was in the movie"…especially when we get in some of the more rundown places. Michael: Yeah, it was all filmed right here in Nashville. In fact, the inner city church [in the movie] is just 8 blocks from here [where the interview took place]. JFH (John): I've really appreciated Steve Taylor's work and I thought the movie was well done. It was a very realistic and powerful story. Have you thought about doing any more acting? Michael: There's another one coming. I'm trying to figure out which one. JFH (John): With Steve Taylor? Michael: You know what, I don't think this next one will be with Steve. I honestly would love to work with Steve again. I just got several scripts that I've been reading and I've been spending a lot of time in Hollywood with some movie houses out there. I have a film company with my son too and we're getting ready to go into production on his first film called Promised Land. We're actually getting great reviews from people that read these scripts. And then I've got another movie that I produced that's on Seaborn Pictures called Kabul 24. It's a documentary about the eight missionaries that were kidnapped in Afghanistan right before 9/11/01. It's unbelievable. JFH (Amy): Are you going to be in that? Michael: Well actually, that's a documentary. I don't know if I'd be in that film because that could be a major motion picture. That's a whole compelling story. JFH (Amy): Maybe you could narrate? Michael: I'll either do that or maybe Jim Caviezel. We've thought about Nicole Kidman. Two of the people are from Australia, the girls are from Tennessee and there were four Germans. There were eight of them and they were with Shelter International and they were kidnapped and they were there for about 109 days. And then all of a sudden, 9/11 happened and Afghanistan is getting bombed… all of these bombs are going off around them and they keep moving from prison to prison. It's unbelievable what happened. The military went in and found them. They came in during the night and whisked them away in a helicopter. It's a pretty wild story. I'm excited about that. JFH (John): Do you ever think you'd work with Steve Taylor musically? Michael: Oh gosh, I'd love to. We wrote "All in the Serve" together. He's a great lyrics writer. He's very talented. JFH (John): When you worked on Stand, it was obviously a much more raw record. How'd you approach that differently from previous albums? Michael: We just decided not to program anything. Everything's just the real deal. It's played live. We just decided that that's the approach that we would take. We just did it all live… there's not one programmed thing on that record. 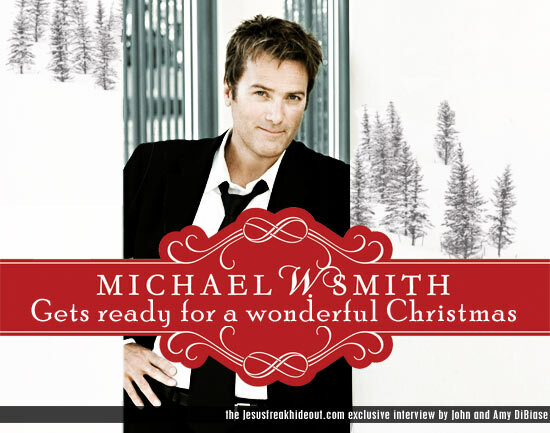 Michael W. Smith's latest project, It's A Wonderful Christmas hits streets October 16th! For video footage from the Nashville Walk Of Fame ceremony, check out the video below!